"CinemAbility: The Art of Inclusion" is dedicated to the memory of nine of its participants. That nine of those who were interviewed for the documentary have died by the time it is released is an indication of how many years its director, Jenni Gold, has worked to bring it to the screen. Her efforts have paid off. Gold is one of the few disabled people, and the first wheelchair-using woman, in the Directors Guild of America and her film has two obvious aims: to look to the past, and provide an overview of 120 years of portrayals of disability onscreen, and to look to the future and discuss how they can be improved. It succeeds in both. "CinemAbility" is the most entertaining and comprehensive history of disability in American film and television ever made. In that sense it is the onscreen equivalent of Matthew F. Norden's classic book Cinema Of Isolation: A History Of Physical Disability In The Movies, and Norden is prominent in the film's opening scenes, explaining the early and generally disheartening history of Hollywood's ideas about disability. Due prominence is given to Lon Chaney, an able-bodied actor notorious in the disabled community for making a career out of grotesque and exploitative parodies of disability. He often did so in partnership with director Tod Browning, who in 1932 made "Freaks" with a cast of disabled actors. Norden uses "Freaks" to make an important point about audience attitudes to disability then that is still relevant now: "Audiences couldn't handle ['Freaks']. People supposedly went screaming down the aisles because what they were seeing on the screen were not able-bodied actors wearing tricky makeup ... They were seeing authentic disabled people." But "CinemaAbility" never feels like a lecture. It is structured like a conversation, with contributions from an array of industry heavyweights, including Marlee Matlin, Ben Affleck, Geena Davis, William H. Macy, Ben Lewin, Peter Bogdanovich and R.J. Mitte. At times this structure works well. When the creator of "Happy Days," Garry Marshall, suggests that the problem with getting "minorities" to play themselves onscreen is "talent" and that it is often better to cast "regular people" instead, he is immediately answered by a clip of the producer Janis Hirsch, who points out that if Hollywood really wanted to find disabled talent all it would have to do is hold wide auditions searching for it. At other times "CinemAbility" would benefit from being less even-handed and more obviously the work of a single, determined filmmaker with a single, determined vision. "Growing up as a wheelchair-user I found many of the representations of people with disabilities onscreen to be confusing ... The person in the wheelchair was always syrupy sweet or angry and bitter. It wasn’t until 'Friday The 13th Part 2' came out that I saw a wheelchair-user the way I wanted to be seen. He was a cool teenager hanging out in the cabin in the woods just like everyone else, he had a girlfriend just like everyone else, and right before he was about to have the night of his life, he got killed by Jason, just like everyone else. His disability was not the topic and was not a factor in his storyline." This passage is not in the movie but I wish it was. It says more in a few sentences about the reality of Hollywood's attitudes to disabled people, and the importance of representation to disabled audiences, than most of the film's able-bodied interviewees manage in the whole film. 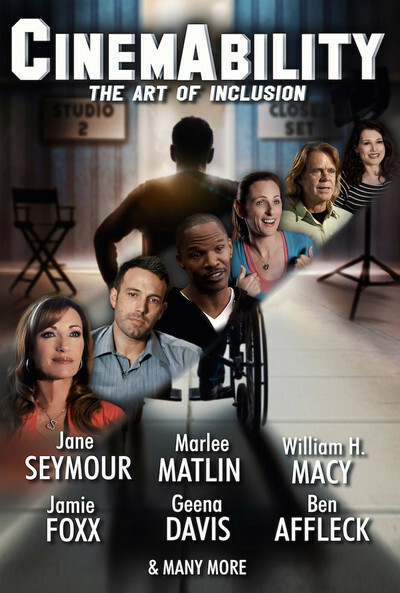 None of the able-bodied contributors come across as bad people, and all are experts on the film business as a whole, but there is a limit to how much insight any able-bodied person can have into what it means to be disabled, just as there is a limit to how much insight a man can have into what it means to be a woman or a white person can have into what it means to be black. At one point, the sighted Taylor Hackford talks about the "helplessness" of being blind and Jamie Foxx, who Hackford directed in "Ray," stresses that being blind was difficult for Ray Charles because, unlike Foxx, he could not remove the prosthetic makeup from his eyes at the end of the working day and go back to being able to see. As a disabled person with a rare eye disease who has had transplant surgery to save my sight, I did not find this especially insightful. But when the camera turns to Tom Sullivan, a blind actor whose break came playing a disabled serviceman opposite Alan Alda in "M*A*S*H," the insights it captures are electrifying. The same occurs whenever a disabled actor talks after an able-bodied one, and the cumulative, perhaps intentional, effect of this suggests that actors who have played disabled roles gain little insight into the disabilities they have portrayed and probably shouldn't have been portraying them to begin with. The poster for "CinemAbility" features the faces of six contributors. Five of them are able-bodied. It's a dispiriting sight, especially for a disabled viewer looking to watch a film about disability subtitled "The Art Of Inclusion." But that isn't the film's fault. The movie's failings—chiefly an over-reliance on able-bodied opinion over disabled expertise—reflect the failings of the society in which it was made. The team behind "CinemAbility" know that documentaries about disability are a hard sell to studios, to distributors, to film festivals, to publications with space for reviews, and ultimately to audiences. To get people to watch they need to push their film's A-List able-bodied stars. My hope is that the success of "CinemAbility" will make that less of a necessity for the next generation of disabled filmmakers making films about disability.